This time last year I was an ambassador for the 2013 IAAPA Convention at the Orange County Convention Center in Orlando, Florida. I was also finishing a year-long professional internship with Walt Disney Parks & Resorts in Kissimmee, Florida. I had a healthy Mom, a healthy Dad, a boyfriend I saw a future with and the world at my fingertips. Today, I have no more Mom, a Dad in the process of finishing chemotherapy, no more boyfriend and still the world at my fingertips. In fewer than 365 days, my life completely and utterly changed its course…which is difficult for someone who prides herself on usually having things fairly put together. On March 21, my Mom had a procedure done that ended in a doctor telling me he was 99 percent sure she had pancreatic cancer…and unfortunately he was right. The moment he told me, in the middle of a busy hospital hallway, was the moment I began mourning the loss of the woman who brought me into this world. Cancer is a beast. It affects every single human being in one way or another. But pancreatic cancer is different. It’s super aggressive. It took away Steve Jobs, Patrick Swayze and my Mother way too soon (she was only 54 years old). It has a 6% survival rate, which hasn’t risen in the last 40 years. And by the time someone experiences symptoms of this cancer, it is more often than not, way too late. So by the time my mom had jaundice (when your skin turns yellow because bile isn’t being processed normally), the tumor in the head of her pancreas was nearing 1-inch in size. Most people do not even know where their pancreas is located, but it is responsible for many critical functions in the body. My Mom’s first appointment to Moffitt Cancer Center was on April 1st. Three rounds of chemo and five days of radiation later, we were pushing towards a surgery date of Aug. 8. The Whipple surgery would potentially save my Mom’s life and give her at the least a 5-year survival rate. The big day came and as soon as the surgeon placed her tiny, delicate hands into my Mom’s abdomen, she discovered several tiny tumors – peritoneal carcinomatosis – the cancer had metastasized. And it was on this day that I had to accept that my Mother would most likely not live long enough to see me get married or have children. Fast forward to Sept. 11 – a day that is difficult enough to get through already – and we were back at the hospital because my Mom’s breathing was labored and we knew things weren’t right. In the back our minds, we figured the cancer had most likely spread to her lungs, but we continued to deny those thoughts and decided we would continue to think as positively as we could. But cancer doesn’t care who you are or how positive your outlook is. Cancer doesn’t discriminate. And it had indeed spread to her lungs. Fluid began to fill up on one side and she ended up having it drained on a few different occasions. But we still refused to believe this was the end. My Mom still had so much to do in her life. 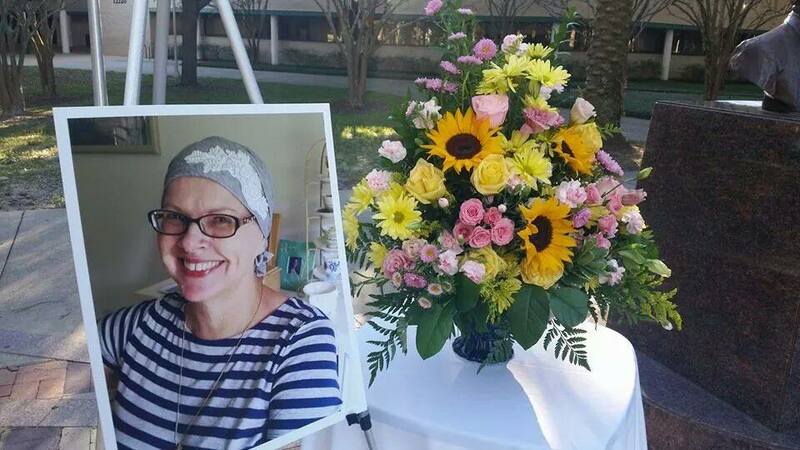 She had a good job, she was finishing her bachelor’s degree in business management…she also had goals to lose weight, but the cancer was already taking care of that and then some. Having lost 85+ pounds in a matter of months, my mother no longer looked like the woman I knew. And even when she could eat, she still continued to lose weight. Seeing someone shrink away before your eyes is something I would never wish on anyone. By the end of September, I knew things had progressed too far. At this point, more chemo and pain management were the only options left. But, the pain was barely being managed and the chemo just caused more pain. My Mom was never afraid of death. Don’t get me wrong – she gave 110 percent and then some…but by the end of the first week of October, I could tell she was ready to go. Her best friend had come down to visit her from Connecticut and she had all of her loved ones around her. She had made her peace and was ready to be done with it all. The chemo. The pain. The constant struggle. And how could I argue with her at this point? My Mom lost her Mom at the tender age of 21. She knew what it was to lose a Mother way too soon and I think that played a huge role in how she raised me and we made sure that nothing would go unsaid by the time she could no longer speak. And that time came by the second week of October. It was then that Hospice care was called to our house. But even with Hospice, my aunt and I were sharing the responsibility of administering liquid morphine every two hours by syringe. It was then that I decided in my heart that this was no way to live and I had to come to terms that it was time to let go. Late at night on Oct. 15, my Mom took her last breath. It wasn’t until the Boston Bruins won in OT that she left us, though. One month later and it’s still so surreal. Meanwhile, back in June, my Dad had an MRI for some stomach pain he had been experiencing. It was then that doctors decided he would have his gallbladder removed, which is a fairly common operation. We humans can survive without this organ. But, during the surgery, a mass was discovered within the gallbladder that was cancerous. So the surgeon not only removed his gallbladder, but the surrounding lymph nodes and a small slice of his liver. And he’s had chemo once a week, almost every week since. And he might have to have radiation as well. But, thankfully, his journey has been no where near as life-changing as my mother’s. Did I mention they’re divorced and I’m an only child? So, yeah, having both parents diagnosed with cancer in the same year, only to be treated in the same exact hospital that is located on your college campus is a very strange way to live. Perhaps I should play the lottery or something. Last year, I saw life in one way and today I’ve been forced to see it completely differently. SO much has changed. I’m 26 years old and I have absolutely no idea what tomorrow holds. And while so much of my life is out of my control, I have learned the hard way that I am at least somewhat in control of where it is going. My hope and faith in people, my will to carry on my Mom’s legacy, and most importantly my perspective is what continues to get me through. I can only hope that reading some of my story can help you put your life into perspective as well. And if anything, my dreams and aspirations are just that much more within reach. Why? Because I have hit bottom. And life can only go up from here. Dreamer. Doer. Always moving forward. Thanks for writing this. I have someone in my family (at least, in my heart they’re family) that was diagnosed with stage three lung cancer recently. And I feel absolutely terrible, because even though he’s still fighting, like you I began mourning his loss as soon as I heard those words (there’s a 5% survival rate). I had been feeling very guilty for this, but reading your words made me feel better to see that I wasn’t the only one. That was beautifully written, by the way. And I am so sorry for the loss of your mother, and…goodness, words can’t describe how much I feel for you, and I don’t even know you that well. Rebecca, from what I’ve come to know of you as a classmate and friend, I can tell you this. You have an inner strength than shines through no matter the situation. The warmth with which you treat people defines you and makes you all that much more endearing. And reading this tumultuous journey you had last year makes me respect you even more. It has not dimmed your optimistic outlook towards life. I’m sure your mom would have been so proud of all that you are doing today, how you are living your dream and making every moment count.